Fun-loving, mischievous Fox wishes he were a tiger. Tigers are big and fast and sneaky. So he decides to become one! Soon Turtle and Rabbit are joining in the fun. But will Fox want to be a tiger forever? 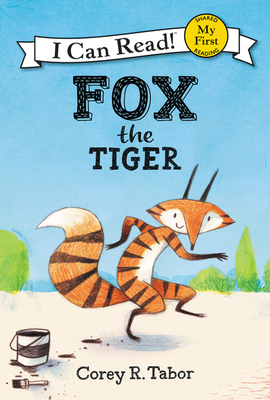 In Fox the Tiger, this winning trickster character and his animal friends learn that the best thing to be is yourself. Fox the Tiger is a My First I Can Read book, which means it’s perfect for shared reading with a child. Other Fox books include: Fox Is Late, Fox and the Jumping Contest, and Fox and the Bike Ride. Corey R. Tabor is a skateboard-riding, beard-growing, book-devouring illustrator. He creates his illustrations with pencil and watercolor and a dose of digital wizardry. Corey lives in Seattle with his lovely wife and spends his time making pictures and stories, including his debut picture book, Fox and the Jumping Contest, and its companion, Fox and the Bike Ride. You can visit him online at www.coreyrtabor.com.